FULTON, NY – Statistics show that 1 in every 8 women will develop invasive breast cancer over the course of her lifetime. In New York State 15,000 women are diagnosed with breast cancer and about 2,700 women die from the disease every year. In recognition of Breast Cancer Awareness Month, Oswego County Opportunities’ Cancer Services program will be working to raise awareness breast cancer and the importance of regular mammograms and breast exams. Program Manager Carolyn Handville (pictured) will be at the Oswego Health’s Power of Pink event to schedule free mammograms to qualified women throughout Oswego County. These women are our wives, mothers, sisters and friends. Here in Oswego County 13 people are diagnosed with cancer and 5 die from cancer each week. Female breast cancer accounts for 11.4% of all cancer cases and 5.2% of all cancer deaths. For Oswego County Opportunities’ Cancer Services Program those are unacceptable numbers that they are dedicated to reducing. In recognition of October being National Breast Cancer Awareness Month, the Cancer Services Program is conducting a month long crusade aimed at educating community members of the importance of breast exams in the fight against breast cancer. “Our goal is to raise awareness of the risks of breast cancer and register eligible community members who are both uninsured and between 40 and 64 years of age into the Cancer Services Program so that they may obtain their free screenings. 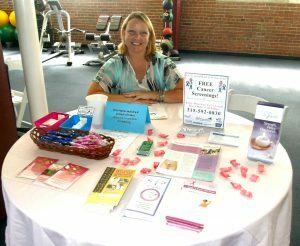 October provides us with added opportunity to promote the services the program offers while there is such a strong focus on breast cancer,” said OCO Cancer Services Program Coordinator Carolyn Handville. As part of its awareness campaign OCO Cancer Services Program will be hosting free mammogram testing at Oswego Health and Fulton Medical Center. Appointments are required and may be made by calling the Cancer Services Program office at 315-592-0830. Handville will also have a presence at Oswego Health’s Power of Pink event that will be held October 19 from 5 to 8 p.m. in the lobby of the Fulton Medical Center, 510 S. Fourth St., in Fulton. Handville will be distibuting information about the free cancer screenings that are available to uninsured men an women age 40 to 64 and scheduling mammograms. The highlight of OCO’s Cancer Services Program recognition of Breast Cancer Awareness Month will be the forming of the 7th annual Human Pink Ribbon. Taking place October 29, at the Hannibal Pharmacy, the Human Pink Ribbon will begin forming at 1:30 p.m.
“I encourage everyone in our community to get your pink and show your support for the fight against breast cancer and for those that have been affected by this disease,” said Handville. In addition to mammograms and clinical breast exams OCO’s Cancer Services Program offers a number of other cancer screening services including pap/pelvic exams and colorectal cancer screenings for men and women. These screenings, which are available free of charge for uninsured men and women between the ages of 40 and 64, play an important part in maintaining good health. “We all know someone, whether a family member or a friend, who has experienced this terrible disease. We want to spread the word that the OCO Cancer Services Program is here to help. Regular breast cancer screenings increase the chances that cancer is found in its earliest stages and the earlier the better. Great advances have been made in early detection and treatment of breast cancer, and many women diagnosed with the disease are living long, healthy lives. A woman’s best chance for survival is finding breast cancer early through regularly scheduled mammograms,” added Handville. For more information on Breast Cancer Awareness Month or for eligibility requirements for OCO’s Cancer Services Program contact Handville at 315-592-0830.